CBIE honours the recipients of our Excellence Awards during the annual conference. Developed by the Board of Directors, the Excellence Awards Program recognizes outstanding achievement in the field of international education in a range of specialties. Awarded to an individual or group for bringing cutting-edge knowledge to the field of international education. Margaret Biggs and Roland Paris are awarded the Catalyst Award on behalf of the study group on global education in recognition of their leadership efforts in seeking to advance outbound mobility for Canadian students as a national imperative. Roland Paris is Professor of International Affairs in the Graduate School of Public and International Affairs at the University of Ottawa, founding director of the Centre for International Policy Studies, and former foreign and defence policy advisor to the Prime Minister of Canada. He is also an Associate Fellow of the Royal Institute of International Affairs (Chatham House). Margaret Biggs is currently the Matthews Fellow in Global Public Policy at Queen’s University. She was President of the Canadian International Development Agency (CIDA) from 2008-2013 and previously served as Deputy Secretary to the Cabinet and Assistant Secretary, Priorities and Planning, in the Privy Council Office. Roland and Margaret served as co-Chairs of the study group. They played an instrumental role in gathering and leading an independent group of educational leaders, business executives and policy experts in seeking to shape recommendations for Canada on outbound mobility. The study group’s efforts culminated in the development of the Global Education for Canadians: Equipping Young Canadians to Succeed At Home and Abroad Report published by the Centre for International Policy Studies and the Munk School of Global Affairs last November. The report represents an important and fresh look at the state of global education in Canada and calls for a dramatic increase in the number of Canadian university and college students participating in international study and traineeship experiences abroad. It sounds an urgent warning that we are not preparing young Canadians to meet the challenges of a rapidly changing world, and it urges a meaningful investment to ensure that Canadian students study abroad, including the provision of targeted support for students from disadvantaged backgrounds so that all young Canadian have the opportunity to benefit from global education. Designation of an individual to recognize long-term service and support for CBIE as they retire from the field. This award bestows honorary membership. Glynn Hunter has been a critical pillar of internationalization in Canada throughout his 30+ year career. His wealth of knowledge and experience helped build the University of Calgary’s international strategy, programs and reputation. His impact extends to the provincial and national levels through his involvement in various boards, committees and conferences. He has contributed to the very knowledge base of the field through his work to advance risk management practices, as well as his research into the international student and study abroad experience. Glynn has had significant influence on the practice and practitioners of international education through his involvement in the International Educators Training Program. Glynn has mentored countless professionals in the field, many of whom are now in leadership positions in their own institutions. 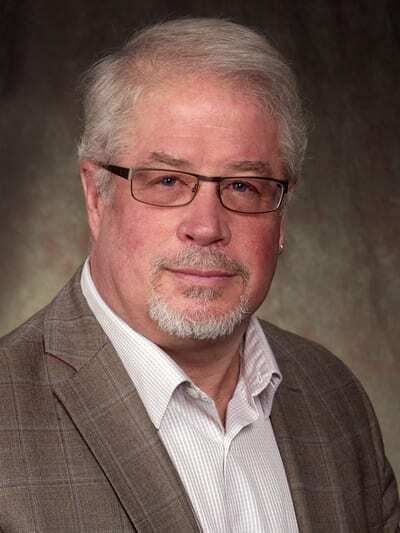 Glynn has contributed to CBIE and its members through service on the Board, as chair of regional and national conferences and through countless conference presentations and workshops. We honour Glynn Hunter for his longstanding service to CBIE and its members, and his contributions to the advancement of international education in Canada. Awarded to an individual who has demonstrated outstanding leadership in the field of international education. 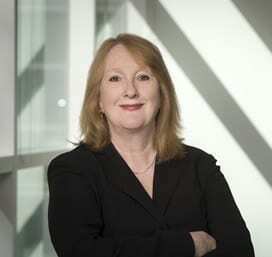 Britta Baron has been the Vice-Provost and Associate Vice-President (International) at the University of Alberta since 2006. Between 1983 and 2004 Britta Baron held various leadership roles in the German Academic Exchange Service (DAAD), including Director of its offices in New York and London. With degrees in Italian, French, History, and German from the University of Göttingen, University of Florence and University of Bonn, she was appointed a visiting professor in Modern Languages at the University of Keele in the UK and has taught in a Master’s program at the University of London’s Institute of Education. She received an honorary doctorate from Oxford Brookes University. She is a member of the Governing Board of Bielefeld University, NAFSA Board of Governors, APLU International Commission Board, the Board of German-Canadian Centre for Innovation and Research, CALDO Management Committee, and the BMW Center for European Studies at Georgetown University. She is a frequent speaker on topics relating to comparative higher education and internationalization, and has published widely. She is co-author, with Dr. Carl Amrhein, of “Building Success in a Global University,” published in 2013. Awarded to a new professional who has shown extraordinary promise in the field of international education. Shay has been in her role since 2014. Since then, outbound co-op mobility outside of Canada and USA has grown more than 40% under her leadership. Her focus is not just on volume, but also on the pedagogy of international co-op experiences, developing student and employer satisfaction strategy, and creating a risk management protocol. 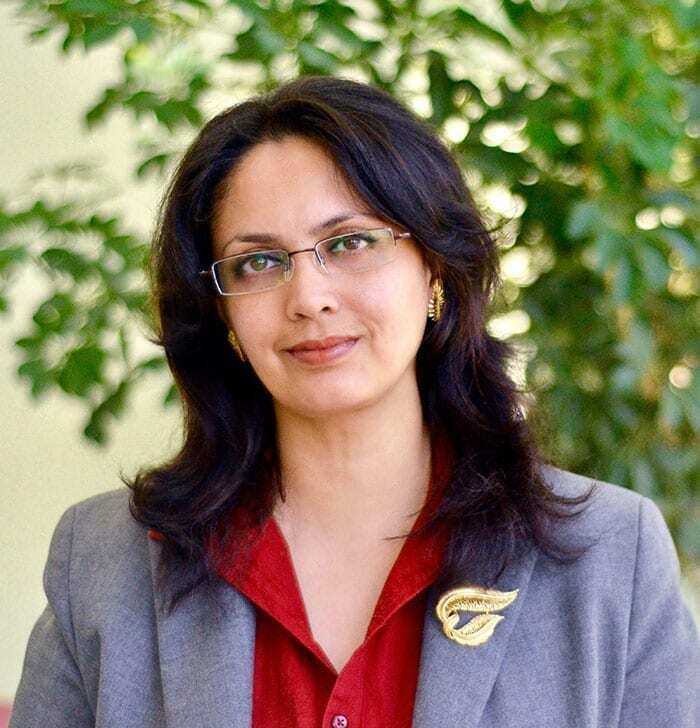 She has led various initiatives on enhancing student understanding of the value of their international experiences, building co-op legacies in international companies as pathways for international collaboration, and designing a risk management protocol for enhancing student safety abroad. However, she firmly attests that none of the above would ever be possible without the fantabulous team that brings their best to the table every day! In the same breath, she is thankful for the mentorship and valuable advice she has received from her colleagues every step of the way. She is grateful for the opportunities that have been made available to her by her department, and hopes to continue contributing to our international education community of practice. Awarded to an international student or group of students in order to recognize those who contribute in a positive way to internationalization. (Ms) Vi Dang has been instrumental in building community and institutional awareness about the needs of international students in Canada. 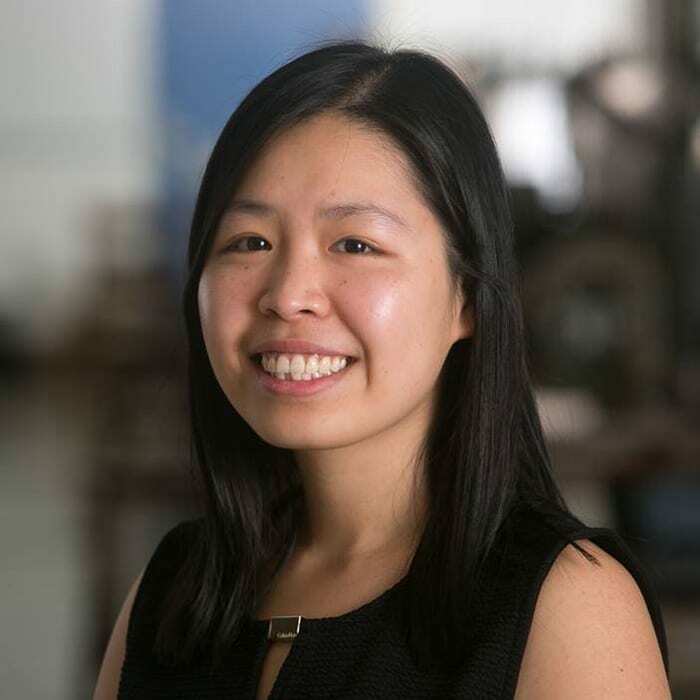 As an international student who came to Canada for high school and continued her studies here all the way to a graduate degree, Vi saw the gaps, believed she could make a difference, and rolled up her sleeves to build a bridge. With her generous attitude, willingness to make things better, and effective leadership, Vi contributed years of service as an undergraduate, and later a graduate student. Not content to stop at her home university, Vi also served as an executive member of Global Hamilton Connect in the City of Hamilton. Through this role, Vi contributed broad advice on problems and potential solutions facing young international professionals. This spring, Vi successfully defended her PhD Dissertation in Chemical Biology, and in June walked across the stage at convocation. In addition to her years of service towards internationalization programs, Vi can now add ‘doctor’ to her long list of accomplishments. Her passion for newcomer inclusion has made a difference in the lives of incoming international students to McMaster and beyond. Awarded to a team or individual to recognize innovation and excellence in design, planning, implementation and management of high-quality endeavours in international education, with programming that focuses on academic, extracurricular, capacity building and/or learning abroad. 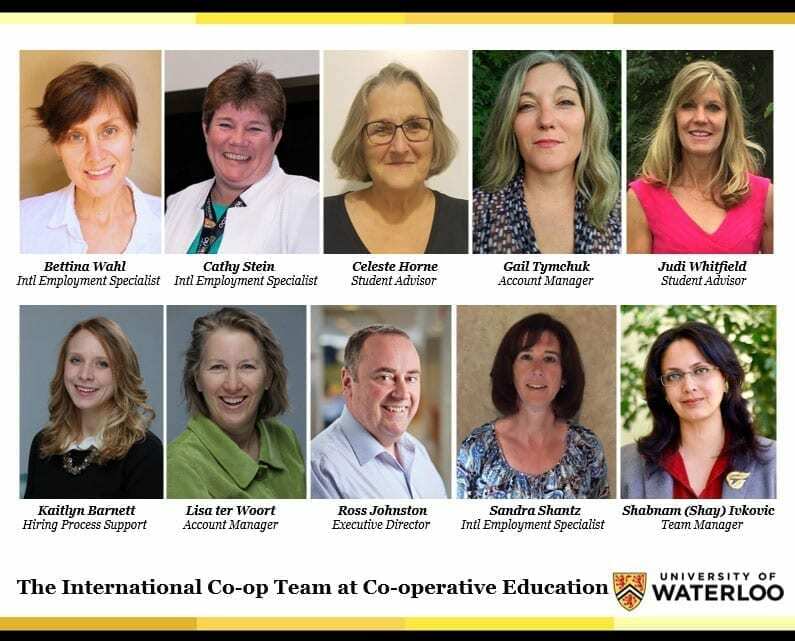 A dedicated team of 8 at the University of Waterloo annually facilitates 900+ international (non-USA) work experiences in 60+ countries, and partially facilitates 2,000+ co-op work terms to USA. In the last 4 years, outbound co-op mobility outside of Canada and USA has grown more than 40% due the various initiatives this team has visualized and put into place. Their focus is not just on volume, but also on the pedagogy of international co-op experiences, developing student and employer satisfaction strategy, enhancing student understanding of the value of their international experiences, building co-op legacies in international companies as pathways for international collaboration, and designing a risk management protocol for enhancing student safety abroad. The team members are: Cathy Stein and Sandra Shantz, who are the International Employment Specialists; Celeste Horne and Judi Whitfield, the team’s Student Advisors; and Lisa ter Woort, Gail Tymchuk and Kaitlyn Barnett, the employer-facing staff. They used to also hire their own co-op student every term (the role is now filled with staff hire, Bettina Wahl) which made them even more aware of the realities of work terms. And then there is Shay Ivkovic, the very fortunate manager of this incredible team who works with Executive Director, Ross Johnston, who leads the team!